For Thanksgiving, our best reason to be thankful, as I said last Sunday. This is one of those cheesy homemade lyric videos, but at least the sound quality is excellent. I know everyone’s going gaga over the new pope, and why not? But his unfashionable predecessor won me over last year with his excellent Christmas-themed book, Jesus of Nazareth: The Infancy Narratives. Since I’m preaching on Matthew 1:18-25, I revisited Benedict’s words about this passage. Like a good evangelical Christian, Benedict argues that Jesus’ mission must place a priority on forgiveness of sins before anything else. He uses the story of the paralytic’s being lowered through the roof (Matthew 9:2-8 and parallels) to make the point. Surely many of the onlookers were disappointed when Jesus announced that the man’s sins were forgiven, while doing nothing to address what the crowd—not to mention the paralytic’s four friends—perceived to be his “real” need: physical healing. I watched Billy Graham’s farewell message on his 95th birthday a couple of weeks ago. Given the anticipation of the event—this will be his last message to the public, his son Franklin said, so be sure to listen up!—I wonder if any TV viewers were disappointed. 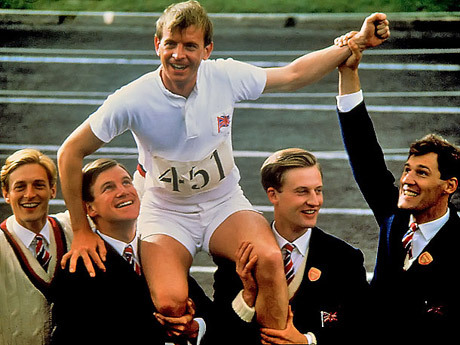 After all the build-up, Graham didn’t say anything he hadn’t been saying for 70 years or so! Graham’s message was exactly the same as it has always been: man can be saved from his sins through faith in Jesus Christ. So place your faith in him right now and be saved. Of course there’s more to the gospel, and more to being a Christian, than that. But you have to start there. That’s the most important thing. My district superintendent, the Rev. Richard Winn, said in a homily to our church’s charge conference that we Methodists don’t talk much about “being saved” anymore, and how that’s a bad thing. I agree. God forgive me for not being more faithful with that message in the past! 1. Pope Benedict XVI, Jesus of Nazareth: The Infancy Narratives (New York: Crown, 2012), 43. Daria’s cynicism resonates with me, although I wish it didn’t. Not that I’m a Gen-Y woman, an urbane New Yorker, or a liberal evangelical, but I am a recovering cynic and smart-alec who appreciates the words of a fellow traveler in Sojourners–blogger Juliet Vedral. 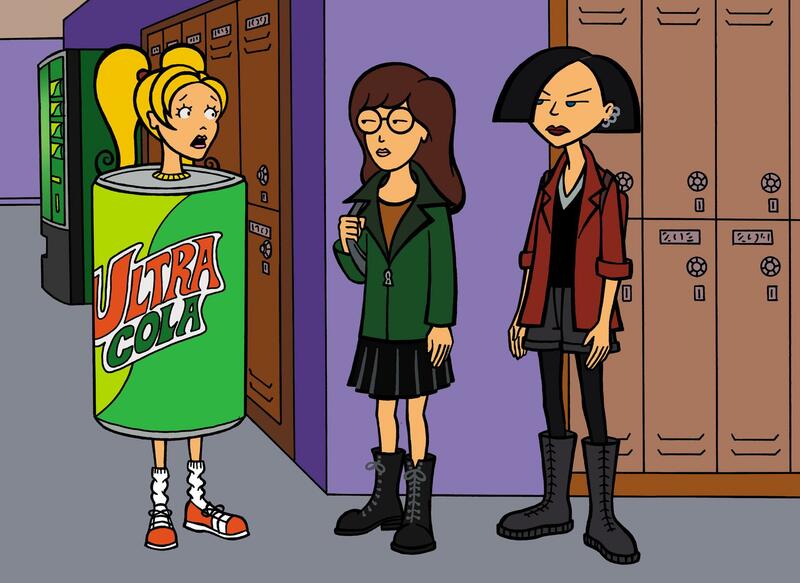 After all, to this day, I believe that Daria is the only justification for MTV’s existence (well, besides Martha Quinn). In this blog post Vedral describes her recent experiences with Beth Moore Bible studies. (Nice allusion to Philippians 3, by the way!) As a guy, I don’t know from Beth Moore (is there a male equivalent? ), but I have, for instance, fallen in love with my ESV Study Bible—a giant brick of a thing, whose scholarship contradicts nearly everything I learned at liberal mainline seminary. Maybe that’s analogous? Regardless, I love this: “Being snarky and cynical, while generating a lot of great material for writing and holding court at parties, never got me very far with God.” Exactly! Like Vedral, I have grown very fond of people who love Jesus. I want to be like them—even more than I want to be smart or cool. Or at least I want to want that, which is progress. Beth may not look or sound or write the way a sarcastic Gen-Y woman would prefer. But when you are trying to learn how to have a relationship with Jesus, being snarky and cynical is a liability. Sure Beth Moore might have big hair and use church-ladyisms, but she knows Jesus (I swear she knows his favorite color). And while I’m busy doing my very best imitation of Daria and shutting God out with my attitude, she’s happily communing with the God of the universe AND then taking the time to write studies so that we could know that God too. Being snarky and cynical, while generating a lot of great material for writing and holding court at parties, never got me very far with God. Beth Moore helped reintroduce me to the “One and Only,” (even writing that made me cringe) and taught me how to make myself vulnerable to that God. And that has softened my cynicism and tempered my snark. Thank you, Beth. Thank you for your faithfulness to share what — and Who — you know. I learned in Systematic Theology class many years ago that, theologically speaking, it’s perfectly correct to say that on the cross God died. I did a double-take when I heard this, but there’s no way around it: Jesus is, as a human being, also fully God. Jesus died, and therefore God died. If you’re a Protestant like me, you may feel discomfort, for example, with Catholics and Eastern Orthodox Christians talking about Mary as “the mother of God,” or (in Greek) theotokos (“God-bearer”). Fear not, for that is also an orthodox formulation (worked out in the sixth century at the Council of Chalcedon). Please note that we don’t, or shouldn’t, say that Mary is the mother of God in order to elevate Mary’s status (which I think is why Protestants are suspicious). Rather, we emphasize that Mary is the mother of God to elevate Jesus’ status: quite literally, Mary gave birth to God—in spite of the fact that she, like the rest of us, was a sinful human being. Similarly, there is a natural reluctance on the part of some to say that on the cross God died because the statement can be (but should not be) construed to mean that everything that is God died. This would be heresy, for it would imply that the Father and the Holy Spirit died. But to deny that God died is the same kind of error as claiming that Mary did not give birth to God. Jesus is only one person, that person is truly God, and if anything at all died on the cross, it was a person. So God died. I put this video together for last Sunday’s Thanksgiving-themed service. I asked people to name one thing for which they are thankful. Enjoy! Here’s a sneak preview for our new Advent sermon series at Hampton UMC, “Reel Christmas,” starting December 1. Prior to his conversion, the apostle Paul believed that God loved and accepted him on the basis of who he was and what he did. This sort of religion remains popular today, even among those who profess faith in Jesus Christ. How can you “rejoice in the Lord,” however, if you constantly worry that you’re not “good enough”? Paul tells us in today’s scripture that we don’t have to be good enough because Christ was good enough for us. We all know that today marks the 50th anniversary of JFK’s death. Did you know that C.S. Lewis died on the same day? 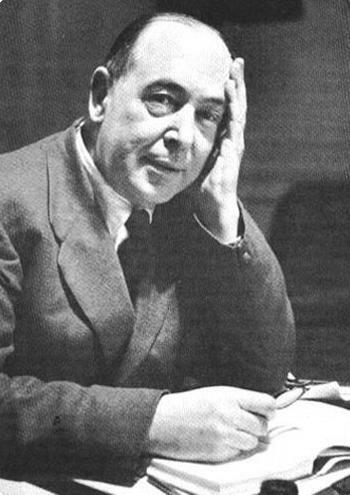 I have a much stronger personal connection to Lewis, whose writings have deeply shaped my life and faith, especially over the past five years or so. In honor of him, I want to post an excerpt from my favorite part of my favorite book, The Problem of Pain. This comes from the final chapter, “Heaven.” This excerpt is far too brief, so feel free to purchase the book here. There have been times when I think we do not desire heaven; but more often I find myself wondering whether, in our heart of hearts, we have ever desired anything else. You may have noticed that the books you really love are bound together by a secret thread. You know very well what is the common quality that make you love them, though you cannot put it into words: but most of your friends do not see it at all, and often wonder why, liking this, you should also like that. He goes on to describe that same elusive thread connecting your love of art, your hobbies, your lifelong friendships. † C.S. Lewis, The Problem of Pain (New York: HarperOne, 1996), 150-151. Can we really trust the “god-of-my-plans”? In his new book, Walking with God Through Pain and Suffering, Tim Keller shares a story told by Elisabeth Elliot in a novel she wrote in the ’60s called No Graven Image. Elliot describes an American missionary in South America named Margaret who has devoted her life to translating the Bible into an indigenous tribe’s native language. The tribe’s language has never before been written down. Key to her work was the discovery of a man, Pedro, who knew the unwritten dialect that Margaret needed to learn in order to translate the Bible into that particular language. He began the to teach her the language, and her painstaking work of systematically recording and documenting it moved forward. One day she arrived at Pedro’s home to continue their work. She discovers that Pedro has a painful, infected wound in his leg. Since Margaret was equipped to provide routine medical care, she gives him a penicillin shot. It turns out he is allergic, and he begins convulsing from anaphylaxis. Within moments, and despite her fervent prayers, he dies. All the years of labor are wiped away. “As for translation of the Bible, of course, I cannot go ahead without an informant. God knew about that when Pedro died. I do not write prayer letters [to my supporters] anymore, for I have nothing to say about my work. It seemed, on the night of Pedro’s death, as though Finis were written below all I had done. [s]he went on to explain to us that the graven image, the idol of the title, was a God who always acted the way we thought he should. Or more to the point—he was a God who supported our plans, how we thought the world and history should go. That is a God of our own creation, a counterfeit god. Such a god is really just a projection of our own wisdom, of our own self. In that way of operating, God is our “accomplice,” someone to whom we relate as long as he is doing what we want. If he does something else, we want to “fire” him, or “unfriend him,” as we would any personal assistant who was insubordinate or incompetent. But at the very end, Margaret realizes that the demise of her plans had shattered her false god, and now she was free for the first time to worship the True One. When serving the god-of-my-plans, she had been extraordinarily anxious. She had never been sure that God was going to come through for her and “get it right.” She was always trying to figure out how to bring God to do what she had planned. But she had not really been treating him as God—as the all-wise, all-good, all-powerful one. Now she had been liberated to put her hope not in her agendas and plans but in God himself. In short, suffering had pointed her to a glorious God, and it had taught her to treat him as such. This isn’t a horrible answer, but it doesn’t account for God’s will in the matter. It’s true, as orthodox Christian teaching has it, that God doesn’t cause evil. But how does that let God off the hook—if that’s what we imagine we’re doing by asserting that God doesn’t cause evil? God has the power, we Christians believe, to answer prayer and prevent evil and suffering. Nearly every time evil and suffering happen, a prayer has gone unanswered, a petition has not been granted. Why does God answer some prayers and not others? Is it because he isn’t as powerful as we imagine? Is it because prayer doesn’t really work? Is it because he really just lets events run their course naturally? I hope not! Yet, in so many words, that’s what we learned about God and suffering in the mainline Protestant seminary I attended. The theological deficiency here is that we have failed to make sense of God’s sovereignty, which is a clear biblical theme. Pastorally speaking, a god who fretfully wrings his hands over suffering but can’t really do anything about it isn’t very comforting, to say the least. No, Keller and Elliot have it right: The correct answer to the question, Why does God allow this bad thing to happen? is this: We don’t know, but we can be sure God has his good reasons. So we can trust him. Besides, if we could fully comprehend his reasons, God would be less than God. 1. 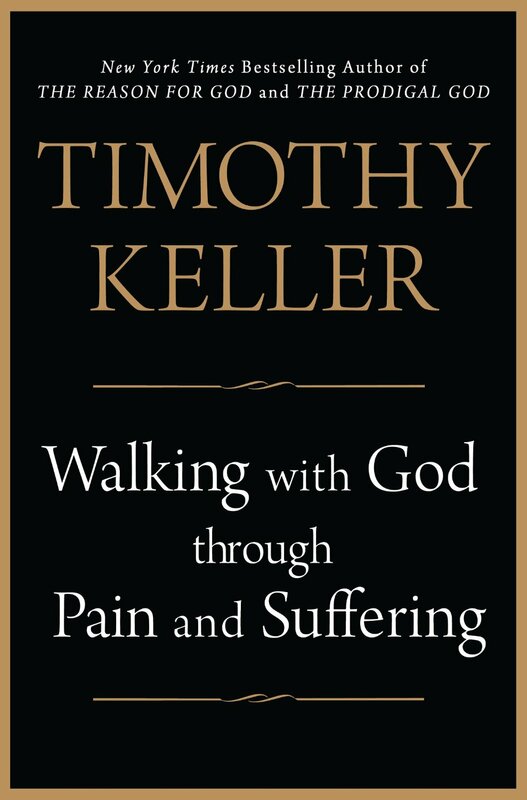 Timothy Keller, Walking with God Through Pain and Suffering (New York: Dutton, 2013), 170. I’m sorry: Cry me a river! This “large number of faithful United Methodist ministers” knew what they signed up for when they were ordained. Many of them had other ministry options available to them if they couldn’t live with our church’s doctrine. I don’t believe that all or even most of them experienced some dramatic change of heart on the subject after they were ordained. No, many of them probably winked and nodded when they were asked questions related to sexuality. It’s a game of “how to answer a question without being completely forthright.” I’m ashamed to say I played it myself back in 2007 when I was commissioned. Let’s not be naive. 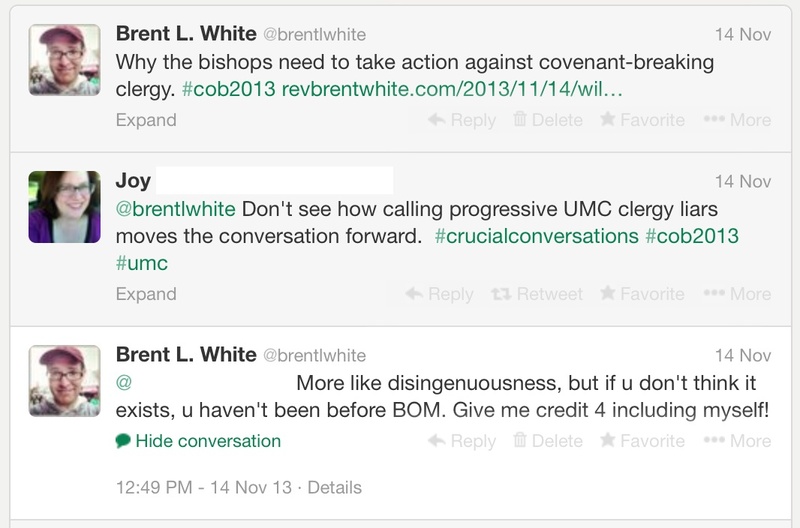 I went on to say that I was interested in moving the conversation “backwards” anyway! I know, pretty snarky. But I only gave as good as I got. Joy said that God is still speaking to us. To which I replied, “Yes, God still speaks, but not in a way that contradicts what he’s already said in scripture.” After which my opponents pointed out that the Bible has contradictions. Now… For the sake of argument, let’s assume that’s true. (I don’t think the Bible has meaningful contradictions.) What’s the point of saying that the Bible has contradictions? After all, my opponents on this issue believe that scripture has authority. They believe that scripture reveals that God is gracious, loving, and merciful, just as I do, but also that God’s commitment to inclusivity of the “marginalized” (how I detest that word) overrides whatever the Bible might also say about homosexual practice. Right? They have proof-texts for their position, and I have mine. My point is, it’s not a good argument to say that because the Bible has contradictions, we can’t therefore believe what it says about homosexuality. After all, in spite of all these contradictions, even my opponents trust what the Bible says about—well—the issues over which we disagree. If the Bible’s contradictions make it untrustworthy, why do they get to appeal to its authority at all? Maybe it’s equally wrong about their understanding of God’s love, or the marginalized, or liberation of the oppressed, or whatever else. Appealing to the Bible’s contradictions is a red herring, since, despite these contradictions, they believe the Bible can be clearly understood on the issue of homosexuality. Both sides apparently think so—whether there are contradictions elsewhere or not. Granted, some of my opponents might respond that if I interpreted the Bible properly, I would see that the Bible doesn’t really condemn homosexual practice. To which I would respond, who cares what the Bible says? If they’re right, the Bible is too filled with contradictions to trust what it says in the first place. Anyway… Returning to my point in last week’s blog post, this gentleman over at IRD went much further than I did in complaining about oath-breaking United Methodist clergy. … United Methodists are facing a crisis of integrity at this very historic moment. Their clergy are openly and flamboyantly defying the 10 Commandments of God. Perhaps they weren’t lying when they first took their vows; we might quibble over the idolatry of contemporary sexual mores. We will let those parts of the Decalogue pass. Today, I refer to the fourth commandment, taking the Lord’s name in vain. “They’re not swearing,” you may contest. But they have sworn! They haven’t cussed, but they swore an oath. In their typical insight, classical manuals of moral theology associated oath-breaking with blasphemy, not just lying. This is because an oath is a commitment to something in the name of God. His name is on the line, from the juridical “So help me God” to the lengthy ordination liturgies. United Methodist pastors promised to God that they would uphold the covenant of the Discipline. God’s not some insensible force or fickle character who can be coaxed to ignore a broken covenant before Him. He has mercy for the repentant, but this open, almost giddy defiance is a blight to the pastoral office and shows no hint of turning back. For the spiritual well-being of clergy and laity alike, the revisionist activists need to be held accountable for their broken promises.